Ruth Askew was born in 1929, the daughter of the village blacksmith at Chagford, on the edge of Dartmoor, Devon. She started to play the melodeon at five years old, after one of her father's customers left an instrument at the forge. From this sprang a lifetime's love of and association with the instrument. Ruth�s individual style of playing developed because, despite hearing the music being played in the pubs, she didn�t get the opportunity to join in with it. In those days pubs were very much a male domain,� especially on market day. She went on to develop her own method and style of playing, mainly for her own pleasure, and took part in the village carnivals and shows and later partnered George Rice, another local melodeon player, at functions in and around Chagford. In 1951 Ruth married and they left Chagford to work in Northamptonshire. In the late fifties they moved to Hampshire, settling at Swanmore, near Bishop's Waltham. When the locals later found out she could play the melodeon they suggested she went to nearby Sam's Hotel at Shedfield where on Saturday nights local traditional musicians would play for their own enjoyment and entertainment of the company. Ruth became a regular 'Saturday Night' musician and struck up an unlikely musical partnership with George Privett. George, a regular at Sam's, also played melodeon and sang a little but was perhaps best known for his exuberant spoons playing. They played together regularly for over thirty years. Ruth and George were twice invited up to play at The Empress of Russia in the early 1980s. Ruth had an extremely large repertory of old songs and dance tunes. She played with Bob Cann, Oscar Woods and many other traditional players in a variety of musical company including barn dance bands and for a while she regularly played in the Kings Korner Carnival Jazz Band in Pewsey, Wiltshire. She was a familiar figure on the sea-front at Sidmouth during festival week, at the 'Hands-On' weekends at Witney and a regular exhibitor with her old instruments at The Great Dorset Steam Fair. She also was a guest at the ECMW at Chagford in 2002. 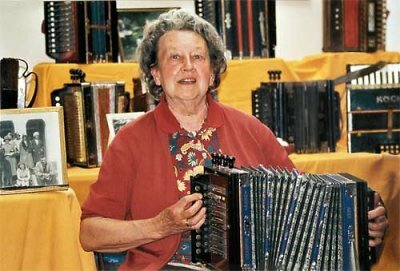 Throughout her life she gathered a large collection of old melodeons and concertinas which she and her husband Alan took to country shows and steam rallies. In recent years you were most likely to find her sat at the front of the display playing one of the old melodeons that she had collected. Ruth will be greatly missed by her family, by her friends and by all those who've enjoyed her music over the years.